Patients often lose their teeth due to trauma, decay, injury, or circumstances requiring extraction. However, losing all or most of the teeth on an arch can prove to be a complicated issue, affecting your mouth’s bite and affecting your ability to chew, speak, and eat. Luckily, Sood Family Dental of Shelby Township, MI offers dentures to replace your missing teeth quickly and easily. 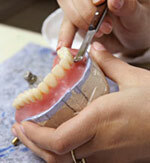 Dentures benefit patients missing all or most of their teeth. Some people choose for dentures for aesthetic reasons. Dentures give you a full, customizable, and natural-looking smile which can make you feel great about the way you look. Additionally, you may need dentures if you have trouble chewing or speaking due to your loose, missing, or shifting teeth. Caring for your dentures will require that you remove them before going to sleep at night and soak them in denture solution while you sleep. Before replacing your dentures, brush them with a denture cleaner and denture brush to remove any food particles or bacteria from the prosthetic. Brush any remaining natural teeth and oral tissues, like your gums and tongue twice a day, and floss between each tooth at least once. Additionally, see your dentist for examinations and cleanings at the recommended two times a year. For more information on dentures or to determine which dentures are best for you, call Sood Family Dental in Shelby Township, MI at (586) 207-1471 today!